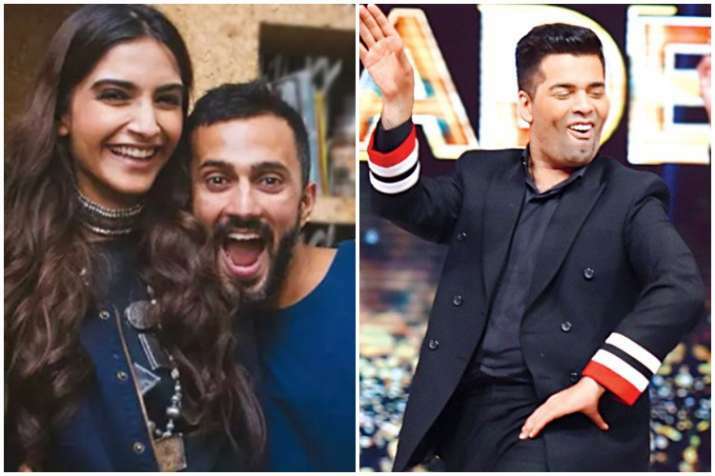 Sonam Kapoor and Anand Ahuja wedding: Is Karan Johar planning to groove to this song on sangeet? If latest reports are to be believed, filmmaker Karan Johar is also going to perform on Sonam Kapoor's sangeet ceremony. Actress Sonam Kapoor and her rumoured beau Anand Ahuja are reportedly planning to tie the knot in May this year. Although Kapoor family has maintained a dignified silence on this topic but reports are doing the rounds that wedding preparations are on full swing. Lately, it was being said that Farah Khan is choreographing all the performances of the sangeet function and now as per the latest buzz, filmmaker Karan Johar will also be shaking a leg at the ceremony on Sonam’s popular song, Prem Ratan Dhan Payo. This is known to all that Sonam is very close to Karan. Thus, the latter is one of the few celebs who will be dancing his heart out at the sangeet. Reports suggested that KJo is very happy that he is performing on Prem Ratan Dhan Payo and his friend Farah is choreographing him. Earlier, it was also said that Sonam’s parents Anil Kapoor and Sunita Kapoor will also be performing at the event. Now, we are eagerly waiting for our style icon to take wedding vows with the love of her life.